Preheat oven to 350 degrees. Boil macaroni in large pot of boiling water, covered, until tender, about 10 minutes (or according to package directions). Add cauliflower florets to pasta water during last 7 minutes of cooking. Remove pasta and cauliflower from pot; set aside. Reserve 1 cup cooking water. Melt Real California butter in large pot over medium-low heat. Add onion and cook until onion is soft, about 5 minutes. Stir in flour and garlic and cook 1 minute, stirring constantly. 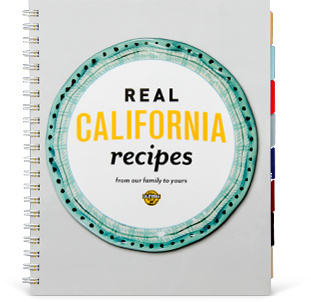 Whisk in Real California milk, garlic, and reserved cooking liquid. Cook over medium heat 7 to 10 minutes, or until sauce is thickened, stirring constantly. Remove from heat. Stir in peas, all but 1/2 cup shredded Real California Cheddar cheese, ground peppers, and nutmeg; stir until Real California cheese is melted. 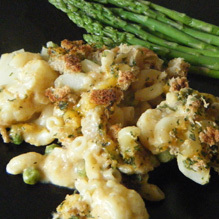 Stir in cooked cauliflower and macaroni. Spray a 9x13-inch baking dish with cooking spray. Transfer cauliflower mixture to dish and spread evenly. Top with bread crumbs, remaining 1/2 cup shredded Real California Cheddar cheese, and parsley. Bake 30 minutes, or until casserole is hot and bubbly. Place under broiler for 2 to 3 minutes, until breadcrumbs are crisp and lightly brown.